Scott Oldford is the creator of The R.O.I. Method and the 6 Pillar Framework. These systems help entrepreneurs scale their businesses and create sustainable business models, allowing them to be successful in all areas of their lives, not just business. Hundreds of thousands of entrepreneurs regularly take his advice on marketing, sales, and mindset. Scott is a sought-after investor and partners with business when they are ready to really grow. Failure is easy. Success is the most difficult. You don’t know what it’s going to feel like to have millions of dollars. Or to have people listen to what you say. I know that people don’t read… they “skim”… so here’s a quick rundown of what you should know about me. I’ve been an entrepreneur since I was 7 years old when I started selling eggs out of my parents garage. By 9, I learned how to program and by the time I was 13, I had a team across the world. By 16, I was discovered by “the media” and won a bunch of awards. I was lucky that business came naturally to me because I wasn’t good in school. I was overweight and not liked by my peers. I enjoyed the “virtual” world more than the “real” world. Between the ages of 16-21, I started a LOT of different businesses and was mentored by some EPIC entrepreneurs… but my EGO crushed me. I ended up losing everything. At the age of 21, I was nearly $1,000,000 in debt and suffering from depression. Like all “hero” stories, I had a moment of reckoning and decided “this was enough”. This is when LeadCraft was born. I started teaching everything I had discovered in entrepreneurship so far in this program. It was a HIT. I sold millions upon millions of dollars from this program. I went from having NO following online to being followed by hundreds of thousands of entrepreneurs. But I had only ever run businesses. While I had a LOT of experience in marketing, being an online “personality” or even *gasp* an “influencer” was new for me. Everytime I wrote something or recorded a video, all of my experience came out… and people enjoyed it. 3 weeks later, I met the love of my life and now wife and fellow entrepreneur, Libby Crow. During this time, I had a LOT of free time and space to think. I completely reinvented myself, both personally and professionally. I started developing systems, frameworks and methods based on everything I knew about entrepreneurship. This created The R.O.I. Method and The Six Pillars Framework. During all of this time, I was helping entrepreneurs and influencers scale their businesses. I decided to start an accelerator called “Project Nuclear”. Shortly thereafter, I hired a CEO to help me run the business. While, I’m leaving lots of “gaps” in this story, let’s move on to current day. Today, I live in Venice, California with my wife and our dog, Cooper. With a team of over 40 people, I’ve been able to concentrate on what I do best… strategy, creativity and being a “human being” instead of a “human doing”. I’m mostly known for being able to take businesses who have momentum and unleashing what I call The Nuclear Effect with an extremely high success rate. This has led to becoming more of a strategic partner and investor in many companies, while still running Project Nuclear for companies who are ready to get to the next step and build a business that isn’t dependant upon themselves. I’m a huge advocate of therapy. Stealing Fire and Passionate Marriage are my favorite books. In my previous businesses that generated $30 million dollars, my motivation wasn’t to get rich, it was because I didn’t love myself. Now, I’m driven to solve the problems of fellow entrepreneurs, so that they have the capacity to solve the problems of the world AND to provide an amazing life for themselves and their family. I’m also passionate about human evolution and what the next 50 years will bring in the fields of A.I and consciousness. And while many people like to categorize me as an internet marketer — I enjoy the investment and growth of all business, with internet marketing being a small piece of it. And if you want social proof… there are plenty of podcasts, articles, and such that you can see below. Project Nuclear is our exclusive business accelerator where we are powerfully installing The R.O.I. 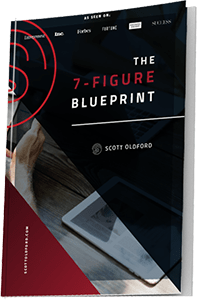 Method into over fifty 7-figure businesses right now. Simply put: If you have a business that’s over 7-figures and you are in the coaching, education, marketing, consulting, mentorship or information space… I can help you grow. If you already have an audience or consider yourself an influencer… I’ll make it happen even faster. Check out Project Nuclear, the R.O.I. Method, the 6 Pillar Framework, and let’s connect if you think it’s a fit to work together.